As Google research confirms, the UK is one of the largest strong holds for mobile app development activities across the entire Europe and offers a revenue-rich, business-friendly market where high-quality mobile apps run their regime. UK enjoys the bragging rights of generating more than a third of total revenues from smartphone software in European continent with almost fifth of total European smartphone applications developers located in UK and more than 30% clustered in London, Manchester and the south east part. After the US which is a top leader in technology sector, the UK is believed to be the second most sought-after tech center and vies fiercely with London’s major European technology rivals such asParis, Munich, Berlin, Moscow and Madrid. 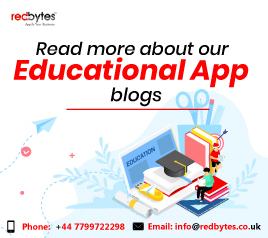 In the following passages, we will delve a little more into the prospects and real-time opportunities presented UK mobile app development market. Due to unbelievable scope of bright career and lush landscape offered by UK app market, it comes as no surprise that developers and designers swarm to UK’s ever-dynamic tech industry, its massive income potential and work satisfaction. Google’s report also reveals that nearly 8000 companies are involved in app development business with approximately 380,000people getting employed for IT-related positions. Based on the market’s expansive nature,Google forecasts 30,000 more relevant jobs will be created in upcoming 12 months. No wonder why start-ups tend to appear in Cambridge, Edinburgh and Birmingham. The research by Vision Mobile, the market analysis firm, estimates that smartphone application sales will exceed 4 billion this year and the resultant revenues is predicted to reach £31bn by 2025. Sponsored by Tech City UK, the research also suggests that while nearly half of UK-based app developers and designers make great income from mobile app development efforts, a fifth of them does not generate any income from apps as they enjoy the process as a hobby. The UK industry has beneficial close links with US tech leaders and UK government also supports the start-up economy as they initiate incentives and investments to encourage more resilient digital ecosystem. Joanna Shields, the chair of Tech City UK considers UK as a digital powerhouse across many technology sectors and believes that the digital industry is driving the UK’s economic future,prevailing in Europe’s app development scenario. If we cast a realistic glance at smart phone usage in 2016, 91% people aged 18-44 owned a smartphone, which amounts to 21 million phones. Statista further estimates that 2017 alone had nearly 42.4 million Smartphone users in UK, which is enough to indicate the boost in a year. These numbers demonstrate a strong evidence that UK is leading the way in European market in the domain of app development,making it a lush place for a mobile app development company to grow and dominate the digital market. There is little reason for an entrepreneur or SMBs to be woeful when it comes to having a mobile app software developed in the UK continent especially after Brexit phenomenon. UK offers the world’s best app developers and costs that border on the global average.The price tags for native and cross-platform app development are quite different with cross-platform tools offering combined backend architecture and reusable code with independent native APIs. 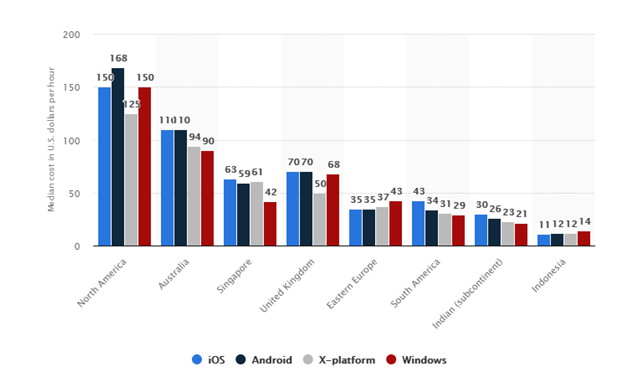 On a global platform, the iOS mobile app development fee stays within the bracket of $28,000 and $50000 whereas for Android it varies from $20000 to $45000. For Windows phones, the cost may touch the mark of $18,000. 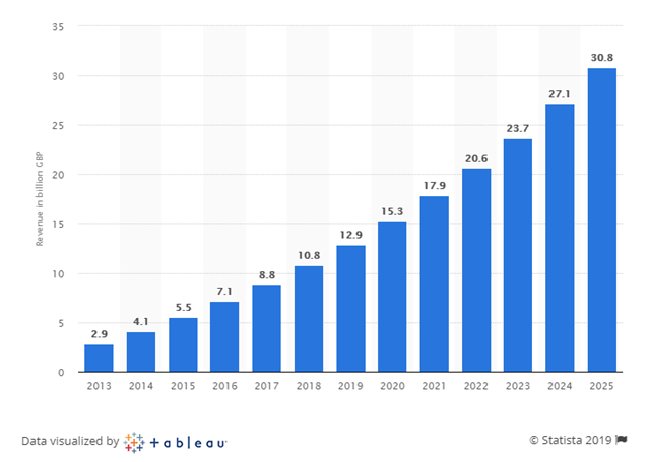 As Statista reports, For Android app development, the approximate figure varies from the average $32 to nearly $167 per hour depending on the length of the project. For iOS, it is $47 to $175 or even a little higher, which is further debatable to project size, expectations and complexity. The per hour amount developers or a company charges hits the all-time highs globally as the demand for advanced features evolves and quality improves. The reason for the high rates is that UK’s digital stage is globally popular for its myriad versed developers and exceptional talents. Another parallel fact that contributes to stiff price rates is that many originally US companies operate from UK and have their offices there. This list is not presented in its absolute order of popularity as it is subject to variable factors including public interest, sources information, play store downloads and digital market analysis. However, there is no dispute that in 2018 these apps ruled the world of UK mobile app users and further encouraged Android and iOS app development. 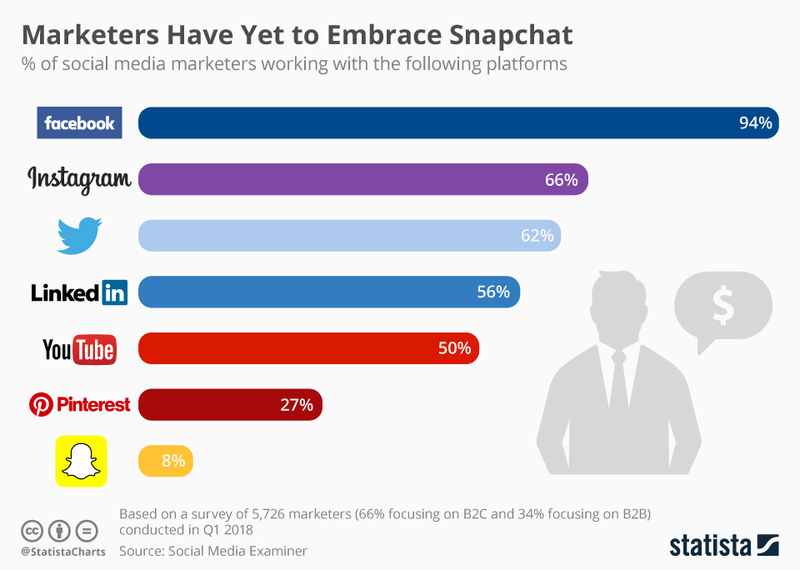 Being popular for over a decade in the market, Facebook still blossoms on number one with stupendous improvements introduced every now and then. On the other hand, owned by Facebook, WhatsApp is massively worshiped among UK users and survived the toughest competitions. It turned out that British smart phone users will access their favourite apps 12 times on a typical day, spending average 17 minutes each day using it. While VR (virtual reality) establishes an all-new reality, AR enhances its digital actualization with a fusion of virtual and real-world experience. By 2020, both AR and VR are predicted to generate $150 billion in revenue, which spawns a more potential market for applications based on these trending technologies. Online businesses such as Amazon Go have already disrupted the retail sector with it. AI is the phenomenon redefining many conventional model of mobile app development industry especially with Virtual Personal Assistants,intelligent chat apps, automation, IoT solutions and more. As stated in the latest report by International Data Corporation (IDC), the AI Technology is likely to create over $47 billion in revenue in 2020. When seen hand-in-hand with Data Analysis and AI, IoT network is going to devise a unique seamless experience with automated functions enabling communication as well as data sharing with mobile platforms and backend system. The emerging popularity and interest in Android Apps is mainly due to its ability to allow users to access apps without installing them. These apps have been a curious trend in 2018 and their quick, instant access makes them even more interesting for consumers of on-demand apps. This section revolves around the small things you should consider while selecting the best mobile app development company from the existing market options. You can conduct a thorough research on your own and refer several online marketplaces where information on app developers is generously available. Portfolio: It shows off almost every aspect of their app development capabilities, the number of apps built, versatile power, industrial insight and relevant experience in your industry. Reviews and recommendations: You can check the prominent reviews from industry leaders on specific app developers or ask them to recommend a company that has helped them drive success to their business. There is no contest in saying that UK app development scene is glittering with stellar talents and achievers, with many big success stories are bred by its digital market. UK app developers have retained a strong global reputation of delivering exquisite apps with advanced features and functionalities. By now you know enough about the promises UK mobile app development market offers and how to approach and hire the agile teams of developers. Make sure you plan ahead to instigate a project with them and share a clear vision of the mobile app.